Last Friday we enjoyed a little visit from the outer bands of Hurricane Sandy. Thank God we only had heavy rains and gusty winds and no real damage here in South Florida. Our thoughts and prayers are with those in the Northeast who weren't so fortunate. The only upside of a late season storm in Florida is the amazingly cool weather that usually follows in its path. Over the weekend and earlier this week we had temperatures drop into the low 50's and even a few nights in the high 40's. Stormy nights followed by chilly weather had me in the mood for soup. 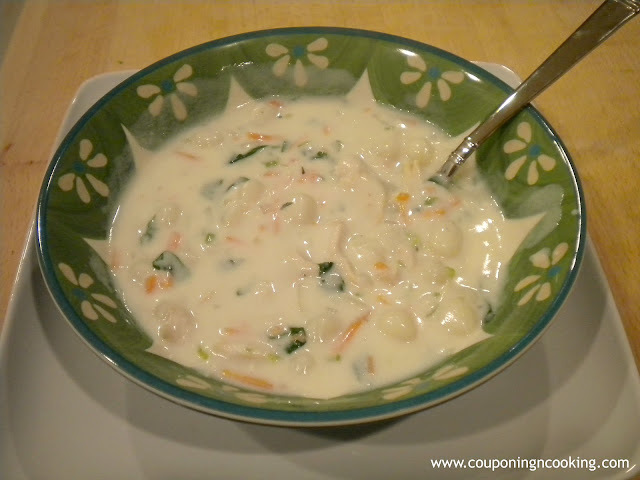 It is so rare that it is cool enough to really enjoy a big bowl of soup that I knew I would have to take advantage of it so earlier this week I finally decided to try CopyKat's version of Olive Garden's Chicken Gnocchi Soup. I pinned this recipe almost a year ago and I just assumed it would be difficult to make. This is my soup of choice for the Olive Garden "Soup, Salad & Breadstick" meal and the idea of being able to make it at home intrigued me. I am so mad at myself for taking so long to actually make it. 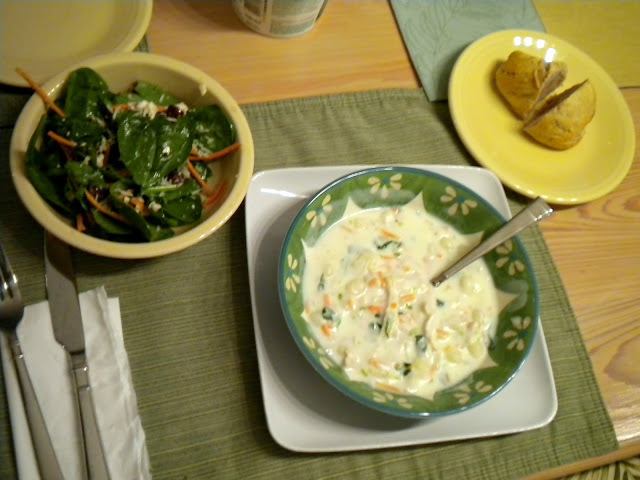 Our homemade version of soup, salad and breadsticks: All from scratch! This soup blew Olive Garden's out of the water. (Not to toot my own horn or anything...) It was so flavorful, so savory and just the perfect combo of ingredients. I love that the soup wasn't too salty and that we could control the sodium by using low sodium chicken broth. My biggest complaint about eating at Olive Garden is that even though it is sooo good it is a little bit salty for my taste. Problem solved! 1.) Heat the butter and olive oil in a large soup pot. Saute the onion, celery and garlic in the oil and butter until tender. 2.) Stir in the flour and cook for a minute before adding in the milk. Add the carrots and chicken and let the mixture simmer until it starts to thicken. 3.) While it is simmering, cook the gnocchi according to the directions on the package. Strain and set aside. 4.) 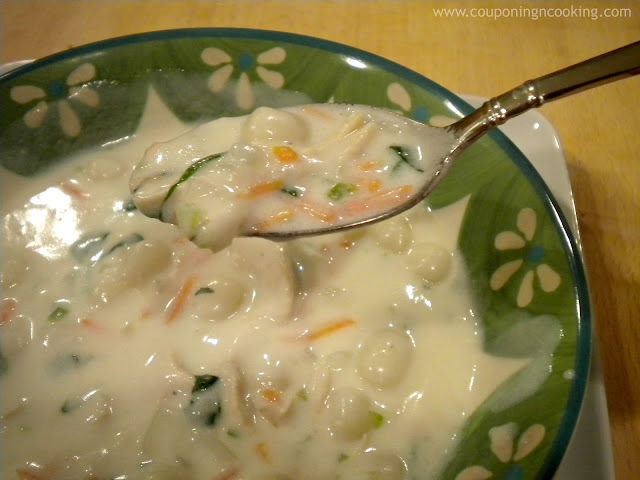 Once mixture is thickend, add chicken broth to reach desired consistency.Once mixture tightens up again, add the gnocchi, spinach and seasoning. Simmer until fully heated through. 5.) Serve with your own version of salad and bread sticks and enjoy the tastes of Olive Garden right in your own home! Get nutritional info by clicking the MAGIC button below! I pinned this - it sounds and looks delicious! Perfect for chilly weather dinners. Looks great! New GFC follower from Full Plate Thursday blog hop. I am so excited to have this recipe, I love this soup. Have a great weekend and thank you so much for sharing with Full Plate Thursday. My daughter made this and said it tastes just like Olive gardens. I'm afraid to make it cause I would eat the whole pot. From the picture looks like yours is even thicker and yummier than Olive Gardens. Thanks for sharing on "I Gotta Try That Monday"
I think I have everything on hand (except the gnocchi) and may change up my menu plan to make it this week for the cold front coming in on Wednesday! Thanks for sharing! This looks delicious! Yum, hope i can find the time to make it one day. I really liked OG's version but I love that you like this one better. It actually looks better than OG! This looks delicious. I love gnocchi! Thanks so much for linking up to Creative Thursday. Can’t wait to see what you share this week! Have a wonderful week. Wow this looks amAzing! Would love it if you linked up on my blog hop www.w-t-fab.com/search/label/bloghop. Also let me know if you'd like to follow each other! This looks delish! It is soup season and we are always looking for new soups to try. Thanks for sharing on Tout It Tuesday! Hope to see you next week. This looks very easy! We LOVE Olive Garden soup in our house. Thanks for sharing at Fabulous Friday. Looks delicious! Thanks for sharing last week on Saturday Show & Tell on Cheerios and Lattes! You are a featured favorite this week! We can't wait to see what you've been up to this week! Have a great weekend! This sounds fabulous! I'm going to try it substituting almond milk and Smart Balance for the dairy. I hope that doesn't ruin it. Wish me luck! You are featured this week on Busy Monday at A Pinch of Joy! I hope you will stop by and grab a Featured Button from the Button Box on the sidebar this afternoon. Pinned. Oh my, this looks so comforting and delicious! Oh my! 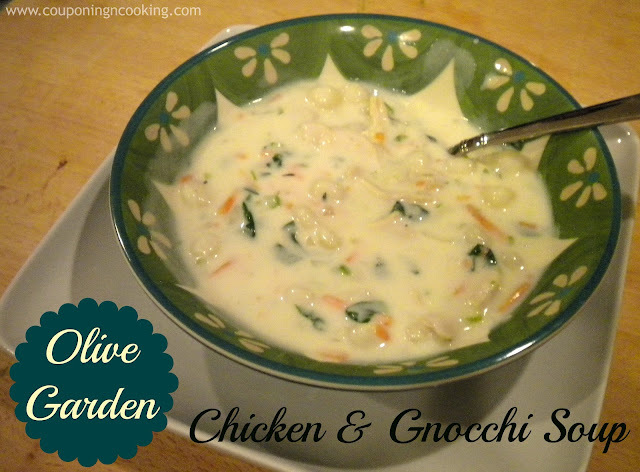 That is my FAVORITE Olive Garden's soup (except for the salt!) I am DEFINITELY going to have to try this!! YUM!!!!!!!! !